After UFC Fight Night 99 wraps up, UFC Fight Night 100 will keep the non-stop action going. Headlining the card will be another rematch, as Light Heavyweight contender Ryan Bader looks to build off his impressive knockout victory over Ilir Latifi against the always dangerous Antonio Rogerio Nogueira. It’s remarkable that Antonio Rogerio Nogueira comes into this contest as the tenth ranked fighter, as he’s a mere 1-2 in his last three bouts dating back to 2014. It just shows how shallow the division and how big of an opportunity this is for Nogueira. Co-Headlining, is prospect Thomas Almeida against Albert Morales. If you recall, Almeida last fought Cody Garbrandt, in which he was knocked out in the very first round. The defeat ended a perfect 21-0 record, as well as momentum to fight for the title. To think, Garbrandt after the win over Almedia defeated Takeya Mizugaki, earning him a title shot. Anyways, as for Morales, he’s former Bellator and World Series of Fighting competitor. He comes into this bout relatively less experienced and with only one UFC fight to his name. In other words, this is a huge opportunity. Also on the card, is former Strawweight title challenger Claudia Gadelha, Thales Leites, Warley Alves, Krzysztof Jotko, Warley Alves, etc.. Anyways, let’s just get to the predictions! 205 lbs. 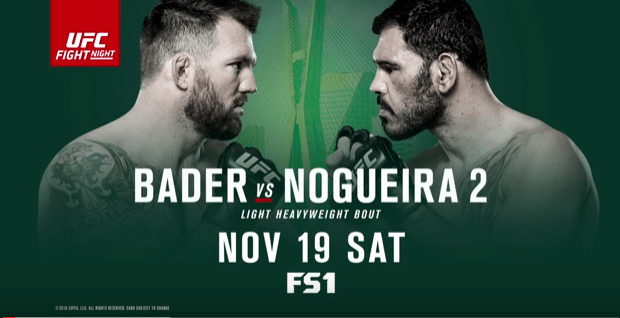 : Ryan Bader vs. Antonio Rogerio Nogueira – Normally, I’d breakdown main events a little more than the other fights, but this one just seems like a no-brainer to me. I mean, Antonio Rogerio Nogueira looks like he has trouble walking and despite shockingly defeating Patrick Cummins, it just seems the amount of battles has caught up with him. Bader is going to have a huge speed advantage and an easy time exploding in for takedowns. The first fight between the two was a toss-up, but this one is just silly at this point. Then again, ranking-wise it’s not bad, but that’s due to a shallow and old Light Heavyweight divison. Anyways, I got Bader by TKO. 135 lbs. : Thomas Almeida vs. Albert Morales – This might be one of the first Co-Main events in which I had little to no idea who one of the fighters were. I mean, why is Albert Morales, who has six fights and only one in the UFC, fighting Thomas Almeida? This smells like a sacrificial bout, in which the UFC is looking for Almeida to get back in the win column and add to his highlight reel. And I think it happens, as I have Almeida via KO! 115 lbs. : Claudia Gadelha vs. Cortney Casey – Gadelha all day here. The former Strawweight title challenger is among the elite in the division, meanwhile Casey while tough and exciting, has nothing for Gadelha. And Casey will find out once they grapple and she gets placed on her back, that she’s not getting up unless she survives the round. So with that, I have Gadelha via a very dominant submission victory. 185 lbs. : Krzysztof Jotko vs. Thales Leites – Fun fight, as you have an up-and-coming talent in the Middleweight division in Jotko against a veteran and former title challenger in Thales Leites. Both men are primarily grapplers, who are formidable strikers. I would say a few contrast between the two, probably is that Leites has more power in his hands and Jotko has much better cardio. As for a prediction, I’m going with Leites. The veteran is just a handful for anyone in the division and I’d be supremely impressed if Jotko could defeat Leites. So with that, I have Leites via decision. 170 lbs. : Warlley Alves vs. Kamaru Usman – This is a really excellent fight, but I’m going to side with Usman here. He’s just an athletic freak, who has some of the very best wrestling in mixed martial. I have high praise and high expectation for Usman, as I believe that he will be cracking the top five of the Welterweight division by next year. And no offense to Alves, as he’s a dynamic striker with excellent grappling abilities. However, he’s going to feel strength and wrestling abilities he’s never encountered. So with that, I got Usman via decision. 170 lbs. : Sergio Moraes vs. Zak Ottow – Honestly, this is a coin flip for me. Moraes is a one trick pony, while Ottow most recently stunned Josh Burkman in a relatively odd and hesitant bout. Other than the defeat over Burkman, I really don’t know to much about Ottow other than his toughness. So, I’m going to side with the grappler and expert submission artist in Moraes, as he’ll get this one to the ground and win via submission. 185 lbs. : Cezar Ferreira vs. Jack Hermansson – I remember when Ferreira was touted to be a Middleweight contender. Then everyone seemingly knocked him out, but credit to “Mutante”, as he’s bounced back with two straight wins. As for Hermansson, he comes into this bout after a successful UFC debut victory over Scott Ashkam. I was really impressed with his footwork, cardio and guerrilla warfare style of striking. The prediction though, I got Ferreira. I think if he can get this one to the ground, he’s going to easily be able to stifle Hermansson. So with that, I got Ferreira via decision. 205 lbs. : Gadzhimurad Antigulov vs. Marcos Rogerio de Lima – Never heard of this Russian cat, but I know Rogerio de Lima can crack. I still can’t get over how he once fought at 185 lbs. Anyways, I’m siding with Rogerio de Lima to welcome this promotional newcomer via TKO. 135 lbs. : Johnny Eduardo vs. Manny Gamburyan – This is a toss up to me, but if I were to give any edge in this fight, I’d give it to Eduardo. He’s got the height and reach, plus he’s got an arsenal on the feet. Gamburyan’s career has tremendously tailed off and I’m not sure how much he’s got left in the tank. So with that, I got Eduardo via TKO! 265 lbs. : Christian Colombo vs. Luis Henrique – I remember seeing Colombo’s UFC debut, which shaky to say the least. He threw tons of knees, but had the worst cardio and just looked like he was 100 years old out there. Henrique has talent and looks to be a solid addition in a depleted and old Heavyweight division. So with that, I have Henrique via KO! 135 lbs. : Pedro Munhoz vs. Justin Scoggins – This is a tough fight, as Munhoz was once a highly touted prospect, who’s progression has been hampered due to fighting some killers within the division too soon. However, Munhoz looks to build off a performance of the night victory over Russell Doane back in July. As for Scoggins, he moves up to the Bantamweight division after having weight cutting issues to make Flyweight. It’s unfortunate too, as he really looked like he tapped into his potential in a thrashing against Ray Borg. As for a prediction, I’m siding with Scoggins. I just think his striking has evolved tremendously and he’s got a Stephen Thompson style to him. While I expect this one to take place on the feet, Scoggins must avoid Munhoz’s grappling. There he will be in trouble, but I have confidence he will and in doing so, will edge this one out via a close decision victory. 205 lbs. : Francimar Barroso vs. Darren Stewart – Never heard of Stewart, but I recall of Barroso fighting some tough guys. That’s good enough for me to side with Barroso via decision.